The Test-Zit Audible Circuit Tester acts as a portable alarm panel, only with a more rapid response. Most alarm panels will respond to an interrupted switch at between 500 to 750 milliseconds. The TZ-5 reaction time is an ultra-fast at 50 milliseconds, allowing the installer to detect potential false alarm problems quickly and efficiently. 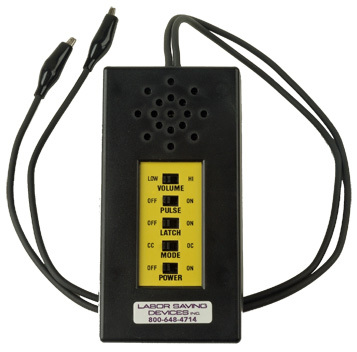 This tester is an essential tool for alarm installers where multiple lines must be checked quickly and accurately. The TZ-5 offers a high and low volume setting, both with “Latch” (manual reset) or “Pulse” (automatically resets after 3 seconds) settings and open and closed circuit settings. This variety of settings allows this unit to be used on all alarm systems (including wireless). ON/OFF LATCH MODE: full Latch Mode that resets manually either by cycling latch switch or power switch; for long duration tests of suspicious circuit. OC/CC SWITCH: for checking normally Open or Closed devices, depending on mode selected. Use the TZ-5 Circuit Tester to identify a variety of wire problems including poorly terminated connectors and broken wires that create “shorting”.